Stumbling upon a childhood photo can be an unexpected pleasure for an elderly person—except when it conjures up memories of the Holocaust. 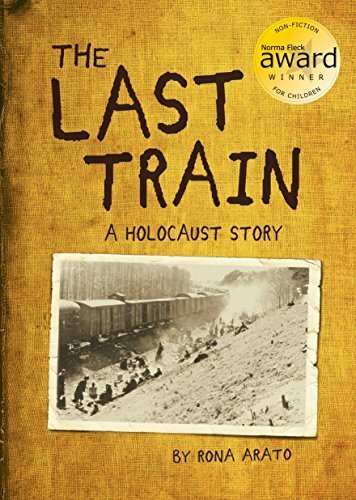 The Last Train: A Holocaust Story by Rona Arato is the true story of how 66-year-old Paul Arato stumbles upon a photograph of an abandoned train (the Death Train) and suddenly relives his time as a prisoner in the Bergen Belsen concentration camp. At first six-year-old Paul, his 11-year-old brother Oscar, and their mother live a fairly normal life in Karcag. But one day the rumors of war come true when Germans march through. Suddenly Paul, his family, and other Jews are virtual prisoners. They are abused and mistreated, and no one—not even their non-Jewish neighbors who were once their friends—does anything about it. Young Paul and the others Jews are stripped naked in front of friends and family and hosed down with icy water. They sleep on stark mattresses in frigid buildings, stand for hours in the freezing cold, and cringe under the heartless treatment of the Germans and their snarling dogs. In one instance, Paul watches as a German soldier shoots and kills a sad-faced little boy because he tells the soldier it is his birthday. Paul, Oscar, and the others finally end up at the Bergen Belsen concentration camp, where they wear tattered clothes that provide no warmth and live off of watery soup made of potato peels. There they try desperately to care for their mother Lenke, often doing her work for her because she has contracted a disease that sweeps through the camp and the Germans will kill her if they find out. Eventually, they and 2,500 other Jews are herded into the infamous Death Train, a stark, dark and cold train that barrels along an isolated track, providing no heat, little light and offers standing room only. When the train stops and the German soldiers line up their machine guns to gun down the Jews, it seems their lives have finally come to an end. The Last Train is a harrowing account of the Holocaust as seen through the eyes of a precocious and once carefree six year old. Ms. Arato, real-life wife of Paul Arato, writes a somber and quiet story that though it brings tears to the eyes, still manages to send a message of hope and survival. Ms. Arato includes several black-and-white photographs of life before and after the German occupation so readers can understand the Aratos’ lives before the concentration camps and the Death Train. She balances these against other heart-wrenching photos of emaciated Jewish survivors, personnel logs with Paul, Oscar, and Lenke’s names listed, and finally, pictures of the disabled Death Train resting quietly on the tracks as newly freed prisoners stream out, arms outstretched, toward their liberators. This book should do well in world history, social studies, civil rights, and advanced or independent reading classes. It might also make a fine collectible for aficionados of World History, WWII history and Jewish history. There are detailed chapters at the end that tell how, after stumbling across the photograph of the Death Train, Paul Arato discovered several of the soldiers who helped free him that day in 1945 were still alive and planning a convention with other survivors. Paul attended that convention in September 2009, and the speech he gave has been reproduced—word for word—at the back of the book. Rita Lorraine Hubbard is a full-time children’s book writer, offering tips to aspiring writers at “Rita Writes History,” a blog that has attracted over 700,000 visitors. She founded and manages Picture Book Depot, a children’s book review website that enjoys a global audience and offers free books to children. She received SCBWI’s 2014 Letter of Merit for a Multicultural Work in Progress, and is Lee & Low Publishers' 2012 New Voices Award Winner. Her new picture book, Hammering for Freedom: The William Lewis Story, will be published in 2018.